This is a beginner guide to karrot-backend by @id-gue and @mddemarie written for people who want to contribute to karrot, but aren&apos;t (yet) experienced Python/Django devs. Welcome and have fun! There are two separated Repos for Frontend and Backend. You don&apos;t need to do the setup for the frontend, but it might be useful to try out your backend through the frontend. Both repositories are not directly connected – the data exchange works via an API. We use Docker for the setup. How to build a Docker container is described in the README.md in the karrot-backend repository. Show the last 12 lines of the server output: docker logs -f <container_name> --tail "12"
Note: The first line shown is an email address. Store it – we will need it for Swagger. First of all, you have to have a Group Model, allowing to create objects like "Foodsavers Berlin". One Group usually has many Stores, like "Bakery Smith". Each store can define events where foodsavers can come by and save food. These events are called PickupDate (one time event) or PickupDateSeries (repetitive event). As logged-in user, you can create and join a Group, what makes you a member. Afterwards, you can join or create a PickupDate event which takes place in the future, what makes you a collector. Collectors have also an option after food pickup to leave feedback. At the moment (September 2017) there are 15 Apps (= folders) in foodsaving. Not all of them are in use or critical for karrot.world since the project is under development and the dev team tries different approaches. In models.py in stores, you can find classes for Stores and Feedback, as well as PickupDate and PickupDateSeries. 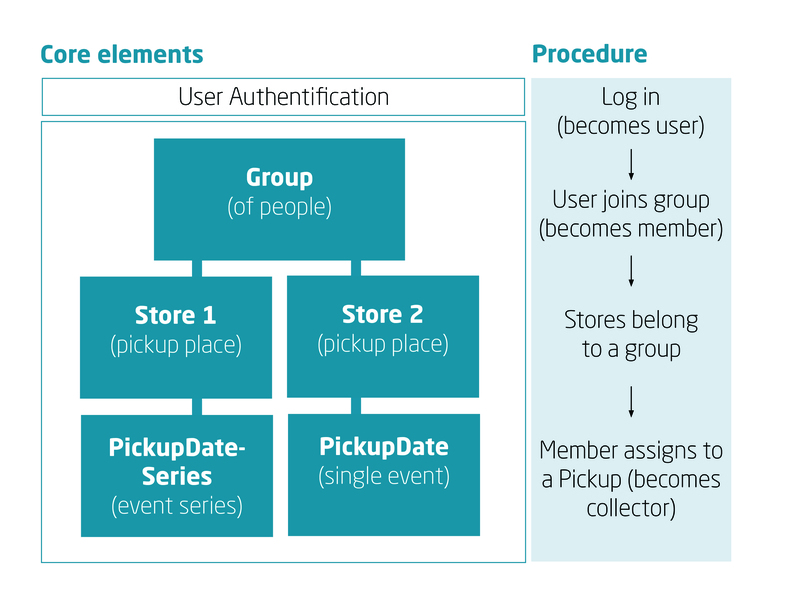 The last two refer to pickup-date and pickup-series in Swagger (see chapter "Server and Swagger") and contain appropriate data fields. PickupDateManager with the method process_finished_pickup_dates is an interesting class because it processes old pickups and moves them into history (even empty ones) - as a result you find PICKUP_MISSED or PICKUP_DONE in the database. In history you find any action regarding stores, groups or pickup-dates/pickup-series from the past. As a result, you find here different HistoryTypus (just “typus” in database), e.g. PICKUP_JOIN and additional data about that action. This helps to keep a track of all actions. models.py Here you define which database tables you want to have and what the fields/columns should store in the database. One model (or class) defines one database table. Let&apos;s have a look at the model Feedback which creates four database fields (and two fields for the id and a time stamp, but these are created automatically here). The following line creates a field with the name comment. The type CharField says that comment will be stored as string in database. The maximum string length is given as DESCRIPTION_MAX_LENGTH in the file settings.py. The entry can be saved even if the comment field is blank. permissions.py Another possibility to check if something is allowed are permissions. They are used in api.py. Here is for example the permission IsNotFull that permits a member to join the pickup event only if it is not full. api.py The api defines how the data stored in the database can be accessed via API. The used HTTP methods (like GET, POST or PATCH) are described in chapter 03 Server and Swagger. Instead of normal Views we use whole ViewSets which allow to combine the logic for a set of related views. Have a look on the class FeedbackViewSet. You will notice that most HTTP methods (like GET) are not defined there but in an imported mixin. Each mixin contains whole logic for creating a single HTTP request. The ViewSets are connected with urls.py and defined there in form of a url. factories.py In a Factory you can create sample data used in the tests. A folder with tests The test coverage of the project is very good and Circle CI will answer in angry red if you try to push untested or non-functioning code. A folder with migrations: You don&apos;t have to care about them a lot here. They are generated automatically when you run python manage.py makemigrations in the shell with Docker active. Please also have a look on the used urls in config/urls.py and on the archive functions in foodsaving/history. Why do you need the server output in the shell? On one hand, this way you will notice when an error occurred (or worse, when the server crashed). On the other hand, you can observe the communication with the server while you interact with it. Swagger shows you the API endpoints that are defined in the api.py files in the apps groups, stores etc. One of the API endpoint is pickup-dates. The Database is automatically populated with sample data if you use Docker. But there are missing connections between: being user -> being member -> being collector -> pick up the food. You can create these connections in Swagger for testing purposes. TIP: If you want, you can populate the database writing some querysets in the Django Shell and then look it up in Swagger. Or you can open PostgreSQL and populate the database there. Whenever you paste the url http://127.0.0.1:8000/docs/ into your browser and hit Enter, you send a request to your local server sitting on your computer (live web sites have their own host server and domain). It depends if you want to GET data or POST data. The server will use the given URL, execute some functionality on the server (probably this includes accessing the database) and respond with a view that you can see in your browser. Every time you run the tests (like described in the chapter Setup), an additional test database gets created. After the tests are done, it gets deleted. It is not connected to the database you use in Swagger. Therefore, we need to populate it for testing new functionality. 1. Integration tests - test not only one class/function in a file but whole functionality of one part of the project. The server is taken as a &apos;black box&apos;, that is, we do not check what it actually does internally. We only verify that it creates an HTTP response that matches our expectations. 2. Unit tests - test only one function/class, e.g. the model Feedback is tested in test-models.py.